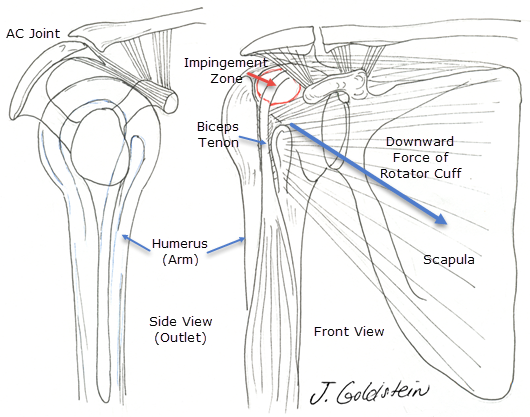 Tear of a rotator cuff tendon of the shoulder is the most common tendon tear in the body. The function of the rotator cuff tendons is three-fold. First the tendons rotate the shoulder. Second, the rotator cuff helps to stabilize the shoulder, acting like the reins of a horse to hold the head in position. Third, and most important, the rotator cuff tendons act to depress (hold the shoulder down), while the deltoid lifts the shoulder up. Rotator cuff tendon tear is usually the result of chronic impingement. This results from tendon abrasion between the acromion (shoulder cap), and the head of the humerus (ball of the shoulder joint). This is similar to kneeling on the knee of your pants until they fray and finally tear through. Tears of this kind occur with little or no trauma. In the case of shoulder dislocation in the patient over 40years old, despite normal tendon strength, rotator cuff tear may occur because of tendon overload. In the younger patient, rotator cuff tear may occur with acute tendon overload as in throwing sports. The symptoms of rotator cuff tear are often indistinguishable from rotator cuff tendinitis or impingement syndrome. Night-time awakening is common. Overhead or reaching at arms length is either painful or impossible. Pain which radiates down the front of the shoulder or into the neck or scapular area is common. Neck pain may mimic primary cervical spine problems, and nerve problems of the hand or arm may also be confused or coexist with shoulder pain. Large tears of the rotator cuff are demonstrated by obvious weakness and XRAY findings which clearly show no available space for the rotator cuff. A special view of the shoulder is highly correlated with impingement and the risk of rotator cuff tear. With large rotator cuff tears, and clear weakness and suggestive XRAY findings, no further tests are needed. MRI or arthrography are needed only if a question of tear size or location are present. In many cases, however, these tests are needed to define the presence of a smaller rotator cuff tear, after a trial of conservative management for rotator cuff tendonitis, which includes physical therapy and anti-inflammatory medication. MRI is a magnetic scan which uses radio waves to create slice-like pictures which are very accurate at demonstrating rotator cuff tear. Arthrography uses Iodine containing contrast material which is injected into the shoulder to demonstrate leakage by plain XRAY. These tests are used in different circumstances, but arthrography is less accurate at defining cuff tear, is more invasive, but demonstrates capsular tear more reliably. Arthrography should not be used with shellfish allergy or known iodine allergy. MRI may be difficult in patients who are claustrophobic, but sedatives may allow the test to be performed. In cases with severe symptoms, arthroscopy may be indicated as the most accurate diagnostic test for rotator cuff tear. Treatment is dependent on multiple factors. These include tear size, functional limitations and pain, patient age, and individual ability to compensate for known rotator cuff tear. Physical therapy, which centers on strengthening of the intact rotator cuff tendons and deltoid, and functional upper extremity use, in many cases results in resolution of symptoms in part or in total. Anti-inflammatory medications may help to alleviate symptoms, but do not help in restoring functional dynamics of the shoulder. If these are not effective in relieving symptoms, diagnostic tests may be the next step in treatment. Surgical treatment of rotator cuff tear is highly successful. Resolution of pain and improvement in functional capabilities occurs in over 85% of patients. Arthroscopic rotator cuff repair has become the most common surgical means of repair. Incomplete resolution of pain, or continued functional limitations are most likely in patients who begin with massive tears. These are often described by the number of tendons involved, since four tendons converge to form the normal intact rotator cuff. Three tendon tears are more likely to have incomplete symptom resolution than one tendon tears, and acute tears are more likely to have good results after repair than old tears with significant tendon retraction. Repair entails tendon mobilization and suture to roughened bone at the normal attachment site. Because the sutures used in repair cannot replace full tendon strength, care must be taken in the early post-operative period to avoid stressful activities on the repair. Surgery is performed in most instances as a same day procedure, but occasionally overnight stay is required. Post-operative pain is minimized by routine use of a scalene block. This anesthetizes the nerves to the shoulder and arm for roughly six hours, and minimizes pain thereafter. The most frequent complication is incomplete resolution of pain, or restoration of full active motion and strength. Infection is seen in less than 0.5% of patients, and is minimized by routine use of prophylactic antibiotics given just before and after surgery. Neurologic or anesthetic complications are exceedingly rare. After Arthroscopy outlines basic surgical aftercare. Physical therapy is of utmost importance in the first two months after surgery. Shoulder motion should be regained rapidly in a passive fashion only. This helps minimize pain and stiffness, and protects the repair. Slowly active motion and strengthening is reinstituted. Below is an outline of therapy guidelines. These are modified depending on tear size and tendon quality. Post op week 6 to 8: --Early isometric rotator cuff strengthening. Active rotator cuff strengthening begins roughly two weeks later. Post op week 20 to 24: --Resumption of nearly normal arm use with avoidance of stressful activities for up to one year. Realistic expectations are important in planning return to normal daily activities as well as sports or work. Rotator cuff tear size is highly predictive in return to heavy lifting; especially overhead or at arms reach. Often jobs must be modified for many months, or a new vocation found, when large tears prevent return to activities which may provoke re-tear of the cuff.